Maryam and Zeid (Photo: Alaa Mina) courtesy of Zeid Hamdan. Lebanese and Egyptian artists Zeid Hamdan and Maryam Saleh bring their Arabic Trip-Hop project to Cairo's Darb1718 this Thursday, 7 June, fusing original sounds and Arab heritage music with electronic beats. The January 25 Revolution sparked a cultural explosion as artists discovered they needed new art forms to properly express the sudden outpouring of political and creative sentiment. The Lebanese art scene also witnessed a similar musical renaissance following the civil war and ensuing regional turmoil. The historical backdrop of both troubled countries, along with Hamdan's and Salah's own personal need to experiment and create new art, brought these two musicians together despite living in different countries. 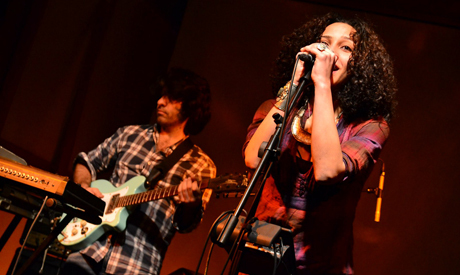 Zeid and Maryam met in November 2010 in Egypt, and only days later started making music together in a studio they set up in a friend's living room. "The first time I met her, I asked [musician and producer] Tamer Abu Ghazala: 'Who is this girl? She's mesmerizing'," Zeid recalled to Ahram Online. In that trip to Egypt, the artists recorded four tracks: 'Eslahat,' 'Watan El-Hak,' 'Nixon Baba' and 'Wahdi,' and even shot a music video. Their music style is Arabic Trip-Hop, a blend of Arabic music, hip-hop and electro beats. Both artists produce their own music, along with covers of old Arabic songs. Zeid, who has been playing music since 1994, is considered one of the pioneers of the Lebanese underground music scene, which in turn is one of the most active in the region. He makes music, collaborating with several artists from the Middle East and Africa, along with being involved in different bands such as Soapkills, Zeid and the Wings and the New Government. "Coincidence brought us together," Maryam told Ahram Online. "Zeid deals with music in an experimental fashion. His musical kitchen is completely different." The artistic duo has been performing together now for two years, having given concerts in Lebanon and many in Europe. After their album is released later this year, they will continue touring. In Soapkills, Zeid collaborated with Yasmine Hamdan, a longtime fan of classical Arabic music. Zeid, who spent his childhood in France, said he never related to this type of music and felt that traditional Arabic music was less accessible due the use of a large orchestra. "Arabic music needs new production," he said. "I felt like giving it a simple, natural feel," he added. Zeid and Yasmine went on to create electro covers of songs from Arab heritage, such as Abdel-Halim Hafez's 'Ahwak,' among others. "Our musical heritage is very strong and has an element that does not die," Zeid explained. "However, the way it is produced gets old, but the melody stays." For Maryam, the story is different. Arabic music from the 1920s is an obsession of hers. Sheikh Imam was a family friend. "He raised me," she said. "He used to sing in my house, on my birthday. I grew up listening to his music." She only started listening to western music – mainly rock, like Pink Floyd and Portishead – a few years ago. When she realised that Sheikh Imam's music, along with psychedelic rock music, had an audience in Egypt, she started blending the two different musical styles. Aftearwards, she formed a band called 'Baraka' and started composing her own songs influenced by Arabic traditional music. Both artists are seen as unconventional in their respective communities. "We're only considered 'underground' because our music isn't spread via mainstream media," Zeid said, adding that he classified his style as "pop music that is easy to listen to." He explained that established methods of disseminating music cost a lot of money, which most new artists cannot afford. "We work online and play live," he said, explaining that people do not really watch television as much as they used to. "Nothing resembles us on TV anymore. We relate to things we find on YouTube, things we share on Facebook; this is the future," Zeid said. "In a few years, underground music will be the music people listen to." Via companies like Eka3, which is the label that produced Maryam's latest Album, 'Mesh Baghany' ('I don't sing'), and which acts as an agent for Zeid, this might come true. Eka3 (meaning 'beat' in Arabic) is a company devoted to supporting and nurturing underground music all over the Middle East. Among the artists the company has signed are: Mashrou' Leila (Lebanon), the Choir Project (Egypt), Pressure Pot (Syria) and Jaddal (Jordan). "Eka3 is the only company in the region that is going through this production experiment, and we try to help them," Zeid said. Maryam has always used the internet to spread her music, and never liked to enforce a structure on her work. "Eka3 is able to achieve this anarchy in a more organised way," she said. Maryam's involvement with Eka3 pushed her to finally release her own album last month. They also helped her establish her musical personality, promote her work, and manage concerts – in spite of the lack of funding on both sides. Zeid also runs an online promotional platform for independent Arabic music called lebaneseunderground.com. The website is similar to MySpace: each musician has a profile where they can upload their music. However, it is not open to the public. Zeid carefully selects musicians working on progressive projects. Zeid is also a producer and continuously encourages more people to get involved in the scene through informal collaborations. "I deal with the musicians like friends," he said. With artists like Zeid and Maryam, who are able to produce work that reflects young Middle Eastern identity outside of the confines of corporate record labels, the music scene is bound to flourish. Listen to their music on 'Lebanese Underground' HERE.